There are many great places to visit including Miami Beach, including sizzling South Beach; Coconut Grove, where trendy meets bohemian in a casual, shady village; lovely Coral Gables, home of the University of Miami, Venetian Pool and Miracle Mile; Little Havana, Cuban to the core; Key Biscayne, an island paradise with large waterfront parks at each end; up and coming Wynwood, Miami’s booming art and design district. You haven’t really experienced Miami until you have explored one or all of them. Miami traffic is famous for blaring horns and break lights. 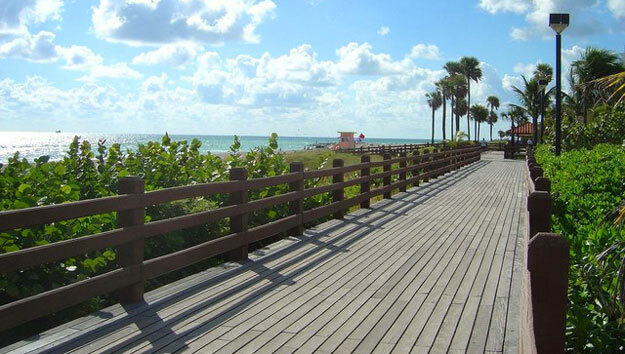 In order to see all of these great Miami locations, a bike will be your best option. Bike & Roll has many options for all types of travelers. The guided bike and Segway tours are great. So is the freedom of renting a bike to head out on your own on a self-guided ride. They have a bike for every kind of rider: comfort and city bikes, kids’ bikes, tandems, and tagalongs, and child seats for the little ones. Their accommodating staff can help you plan your route using their detailed map. Be creative and design your own tour! Here are some ideas to get you going: Bike around super-glam South Beach where all the beautiful people hang. 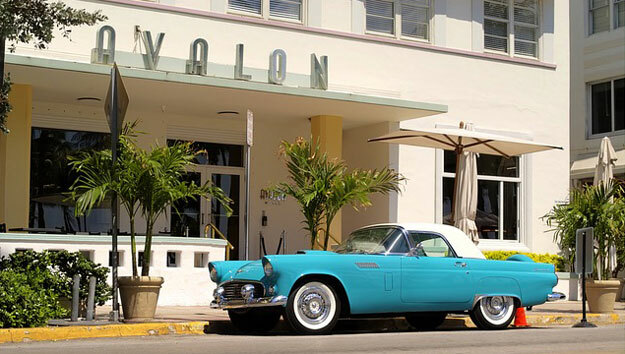 Pass lovely beaches along the oceanfront path, head down Ocean Drive to take in the scene and the picturesque pastel Art Deco historic buildings lined up in a row. Stop for a drink at in a patio bar or for a bite in a sidewalk café. Drop by by Versace Mansion and discover its breathtaking beauty. Cross over to Washington Avenue to discover the bohemian charm of Espanola Way. Ride up to Lincoln Road for great shopping, lunch, then on to the Bass Museum, the moving Holocaust Museum. Here’s another plan: Just north of Lincoln Road, head down 17th Ave to Venetian Causeway. It’s a delightful ride along a dedicated bike lane, with cooling breezes and mansion views. Once over the Venetian, head south down the mainland coast along Biscayne Boulevard to Bayside Marketplace, a super fun place along the Bayfront to grab a bite to eat, shop and people watch. Don’t want to pedal back? For an extra fee, hop on a water taxi with your bikes in tow for a trip out on the Bay, past exclusive Fisher Island to Miami Beach Marina. On the mainland, routes branch out offering even more options. Little Havana is an immersion into traditional Cuban culture. For a caffeine jolt, enjoy a cafecito or colada along with real Cuban food at one of the restaurants along the ride. Or, head south towards Coconut Grove on S. Miami Avenue and stop at palatial Vizcaya; the bayfront mansion and formal Bayfront gardens are gorgeous. Continue down along S. Bayshore to the Grove, a super fun place with a village atmosphere, shopping and outdoor cafes. 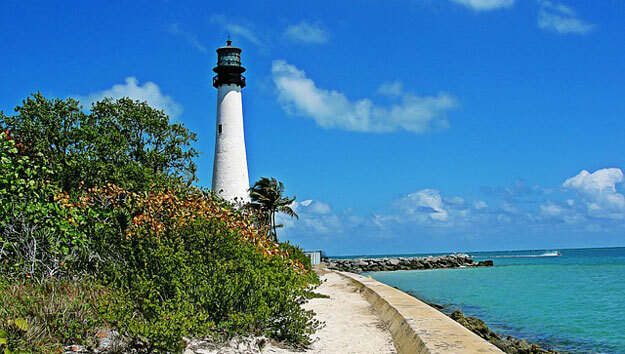 Or, spend several hours on a ride all the way down to Cape Florida Lighthouse on the tip of Key Biscayne. It’s a long, but fun ride! Or, ride through the shady and elegantly beautiful Coral Gables. Make your way to Miracle Mile for shopping and lunch. Too tired to bike back? Hop on the Metrorail (overhead transit system) across from the University of Miami campus. Get off at the Vizcaya stop and pedal back to Bayside where you can catch the ferry to Miami Beach Marina.